Keep reading to learn a bit about how the 2017 Honda Civic Hatchback can make your life better with its great technology features. Dual-Zone Automatic Climate Control – Never compromise on the temperature; always find the perfect one for you with separate temperature zones for front passengers. Push-Button Start – Don’t worry about rooting through your bag to find your keys; this system starts up your vehicle with a simple button push. Heated and Powered Front Seats – With heated and adjustable front seats, passengers are able to reach their peak of comfort easily. Capless Fuel Filler – One less step at the gas station combined with the vehicle’s amazing fuel economy means less time spent at gas stations. Cruise Control – Also available with adaptive cruise control with low-speed follow, this feature makes long journeys a little easier to manage. Apple CarPlay and Android Auto – Access your favorite music and apps through the Display Audio touchscreen with ease. 7-Inch Display Audio – With a high-resolution WVGA electrostatic touchscreen and customizable feature settings, you can easily find and interact with the apps you use most. 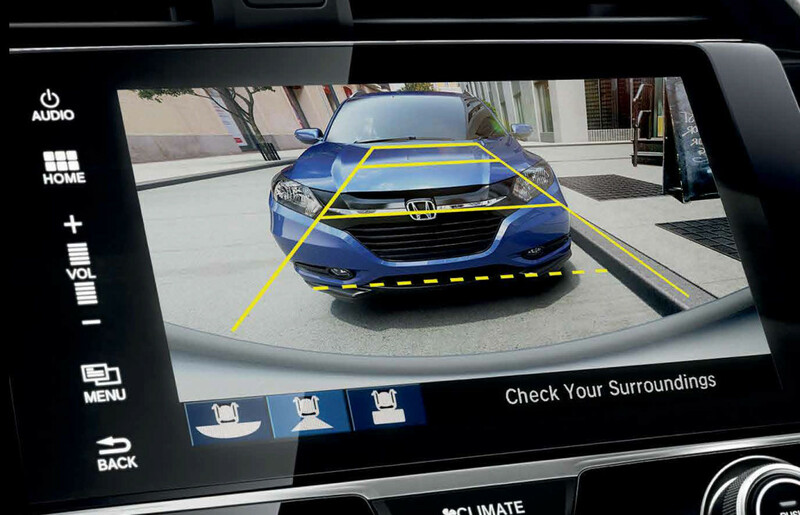 Honda Satellite-Linked Navigation – With the help of HD Digital Traffic and voice-recognition technology, this navigation system has all your bases covered. SiriusXM Radio – If you’re looking for more variety in your music selection, SiriusXM is where you’ll find it. SMS Text Message Function – Keep in touch with friends and family with the ability to send and receive texts without taking your eyes off the road. Honda LaneWatch – This feature allows you to be fully aware of vehicles in your blind spot whenever you signal to switch lanes, so you can do so safely. Lane Keeping Assist System – If your vehicle starts to venture from your designated lane, this system works to keep you in line and correct your steering. Collision Mitigation Braking System – Avoid rear-ending with the help of this system, which can apply the brakes if it detects the Odyssey approaching another vehicle too quickly. Multi-Angle Rearview Camera with Guidelines – Three angles allow you full view of the rear of your vehicle, reducing the chances of an accident when reversing. Tire Pressure Monitoring System – To keep your vehicle running at its best, this system alerts you when tire pressure drops below the ideal so you can address it before it becomes a problem. Take full advantage of everything that the 2017 Honda Civic Hatchback has to offer as soon as possible. Visit your local Central Illinois Honda Dealer or contact us online for more information regarding scheduling a test drive, financing options, and current offers. We can’t wait to help you find your next new Honda!